They can tell a visual story, or be used as a meditative or creative practice. They create a safe space for healing, and a way to explore and understand ourselves and our world a little better. They can even be used as a process for making positive changes in our lives. Journaling gives you a way to discover the answers to the questions that lie deep within. as well as processes for using them. 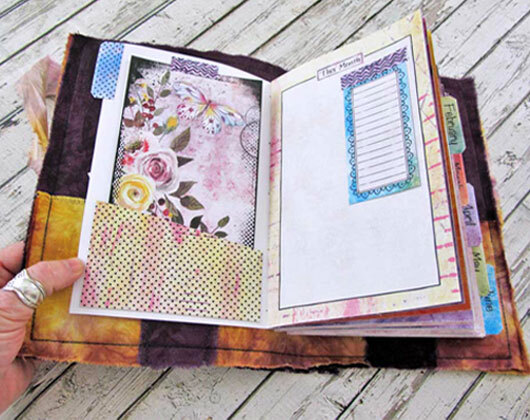 to make beautiful and creative journals that can be used as a place to hold and treasure your personal stories. Discover how to create your own symbolic language that will allow you to express yourself in a visual way that only you can understand. During each workshop I’ll be sharing my tips and techniques for making all types of journals, as well as ideas and processes for using them. It’s my hope that along the way you’ll discover just how rewarding creative journaling can be, as a way for telling and sharing stories, for personal healing, or simply for the sheer joy of making beautiful art books. I very much enjoyed the first month’s lesson and working on these journals! I am thrilled to have learned how to tea-dye pages and to sew in the signatures. Thank you and all of the group members for sharing their expertise. I’m going to start another journal and I look forward to next month’s lesson. Thank you Linda Matthews for making this group and for inspiring people with your style and knowledge. I am a newbie, but I have set up my craft room, collected tools, material, avocado dyed, coffee dyed papers, fabric, sewing machine, paper cutters, etc. Your style speaks to me like nobody else…. and that says a lot, I have been watching tutorials by almost everyone out there! I know what I want to be able to do, and your tutorial examples are so right on. I very much liked and learned a lot from the December project. If I had to choose the very best, most meaningful thing, it would be the accountability system: At the end of the day, writing on the day’s square in the monthly calendar what I did toward my artistic goals. A few times I realized I had done nothing–and, not wanting to break the chain, I embellished a journal page or sewed a seam so that I could write something on the calendar. I’m looking forward to doing my first monthly review. Supplies vary from month to month depending on the project, however a complete supply list is included with each video workshop. In the meantime you can find a list of the supplies that I use here. In this 3-part video workshop, learn how to make a themed journal that tells a story. Create your own Book of Winter Shadows using your own images and photos as a way to tell the story of winter and all the shadows that this season brings. Winter can be applied not only to the season of nature, but also to our own wintery feelings – a time when we look deep within to where our own internal shadows lie. Learning to express those feelings through art and journaling often has a healing effect, as the heavy energies of those shadows are lifted from our soul and transformed onto the pages of our journal. Learn how to make an easy but creative vintage-style journal which has a simple cover design that can be creatively embellished, an inside cover pocket, a hidden spine, and blank vintage tea-stained pages that are just begging to be used. The Creative Vision Planner Journal is the perfect way to start the new year by taking a positive step to making improvements and changes in your life, and watching your dreams come to life. By this time next year you can look back, as I’m doing right now, and be amazed to see how things have unfolded. In this video workshop (available 1st May 2019) take a meandering journey down the path that leads into your own untamed garden. Using images and words, fabric and stitch, embellishments and ephemera – you’ll learn how to tell a visual story of what lies within your garden – and perhaps even what you hope to find hidden there. Snippet Roll Journals are fun and easy to make, and are a perfect way to tell a visual story using an unconventional journaling format. These types of journals can be made in any width and length, and then wrapped around, or hung from, a spool. They are a perfect small sewing project for travel, or for times when you only have a few minutes to sit and stitch. Creative Art’n’Soul Journaling begins 1st November 2018 and runs for 12 months. You can sign up at any time and get access to the current series of monthly video workshops as well as all upcoming workshops – a full year of tips, techniques and processes for making and using creative journals. An email notification will be sent to you on the 1st of each month letting you know when new content has been added, and you can then work through the lessons at your own pace. Payments are handled via Paypal. You don’t need a Paypal account when paying by credit card; you can simply use the guest checkout. After payment, please check your inbox for an email with a link so you can register to access the workshop. After payment, please check your inbox for an email with a link so you can log into the online classroom where you’ll find your workshop.